Had a great time at Spa F1 2018 with InTentsGP, weather was a challenge but the team dealt with everything we asked for and did their utmost to make sure we had a great time. Food was great, the ability to buy sandwiches to take into the circuit saved us a fortune and coming back after a long day to a warm bar and a hot meal was wonderful; highly recommended! The Intents guys were amazing - they took time to get to know us and made the experience really personal to us all. The facilities and service they provided was brilliant . Anything we needed, they were on hand to make sure we had it, from all the tea I could drink to hot water bottles! It was so great to know that even though we arrived in the dark everything was there ready for us and that we didn't have to get dirty putting it all away. The circuit is only 30 mins away, which means that you always feel close to the action. I would definitely do it again and would thoroughly recommend. So thanks so much to the Intents team, esp Alex and Antony, for making our Spa experience so special! 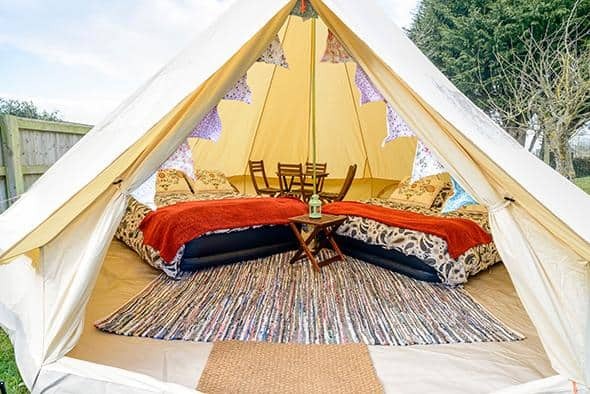 You can enjoy our luxurious and spacious glamping bell tents for up to five people with all the trimmings at the 2019 Belgian F1 Grand Prix at Spa Francorchamps. Make your race weekend the most relaxing, hassle free ever by staying with us. A family business. We have been trusted by thousands of customers since 2009. Up to a five night stay (Wednesday/Thursday/Friday/Saturday/Sunday nights) if you wish. Why not arrive on Wednesday so you are ready for the free pit lane walk/driver autographs* on Thursday? We do not charge per person but we now offer the facility of adding an extra guest to our glamping tents to give you more flexibility. 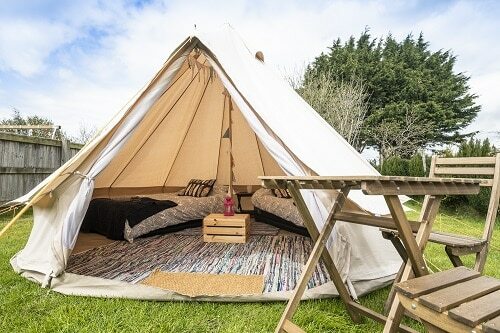 For example, three people in our 2/3 person glamping tent for 2 nights costs £769. If the third person is a child under 15 years of age (at the time of the event) then contact us for a special price. If you book five nights (arrive Wednesday and depart Monday) your fifth night is FREE.